2. Light up the darkness with renewable energy. 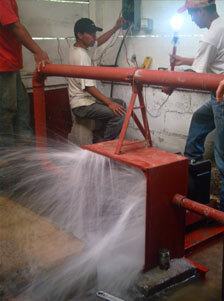 AIDG started by working on Hydroelectric systems. With help from the UNDP, AIDG's first enterprise XelaTeco (later Techlogia Ecologica de Occidente) brought electricity to 40 homes at Comunidad Neuva Alianza for the first time (inset pictures and photograph to the right). A 75KW system was completely reconditioned for La Fe and Chantel and transmission was rebuilt for La Florida (large photograph). 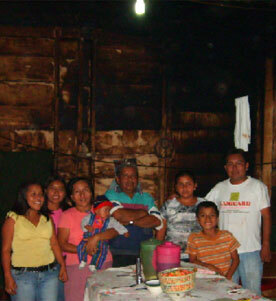 Other systems developed include a Mitchel Banki system at El Corazon Del Bosque. 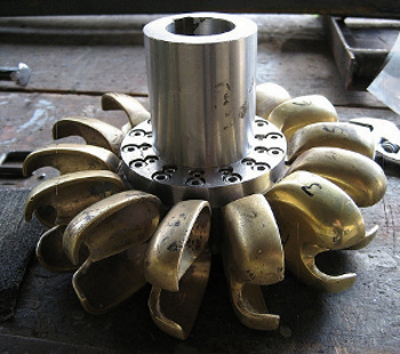 Design manuals for different aspects of the hydroelectric systems installed by Xelateco include, the Mitchel Banki system design and appendix. The Nueva Alianza overall system design, modifications to the deflectors, and modifications to the ELC (electronic load controller) design (English), (spanish). A full zip of the files needed to recreate the hummingbird ELC with IGC (induction generator control) will be made available shortly.